of the United States troops on shore had any effect in dethroning the Queen or the establishment of the Provisional Government? Mr. Oleson. I do not think it had the slightest. Senator Frye. And if the troops had remained on board ship the same thing would have happened? Mr. Oleson. I think the same thing might have happened. But I think something else would have happened—there might have been irresponsible parties turned upon the community, and incendiary fires and bloodshed might have followed. Senator Frye. But as to the establishment of the Provisional Government? Mr. Oleson. As to the establishment of the Government, I do not think it made any material difference. Trousseau once more—He is again brought to a reckoning—This time President Dole secures a retraction of some statements to Blount. "Almost daily, to my personal knowledge, meetings were held at Mr. Stevens's house in which the possibilities of a peaceful revolution with the prospects of annexation were discussed. Prominent at these meetings were the chief justice, Mr. Dole, Mr. Thurston, Mr. Hartwell, Charles Carter, and others, also Capt. Wiltse." This statement, which has been published in the Commercial Advertiser at Honolulu, is incorrect as regards myself. I was never present at any such meetings, nor was I aware that such meetings were held until informed of it by the publication of your statement to that effect. I desire that you will make due reparation in the matter with the same publicity which the above statement has already received. Dear Sir: When I made to Mr. Blount the statements you refer to in your letter of the 27th, I believed them to be correct, as my information came from a source that I could not consider but reliable. In spite of difference of opinion and bitterness of feeling on my part engendered by the vile abuse I have been submitted to by your political side, I have always considered you as a gentleman. You say that you attended no meetings at Mr. Stevens's house; let it be so; I accept your word for it. Trousseau and truth—Where they fail to agree in their evidence—Chief Justice Judd and Judge A. S. Hartwell deny statements of his to Blount. Dr. Trousseau's statements to Mr. Blount, so far as they refer to me, are totally untrue. I never met any of the gentlemen named by him at Mr. Stevens's house. I never attended any meeting with the gentleman named or with any others at Mr. Stevens's house, or at any other place, where annexation was discussed. I do not consider that I owe my "social and pecuniary position" to the natives, although I believe I have their confidence and good will. Before my appointment to the bench, now nearly twenty years ago, I was receiving a handsome income from my practice at the bar; greater than my salary as second associate justice, which was my first appointment. I took no part whatever in the revolution of January, 1893, nor was I informed of the plans of the movers in it. I had no more information than any other "outsider." 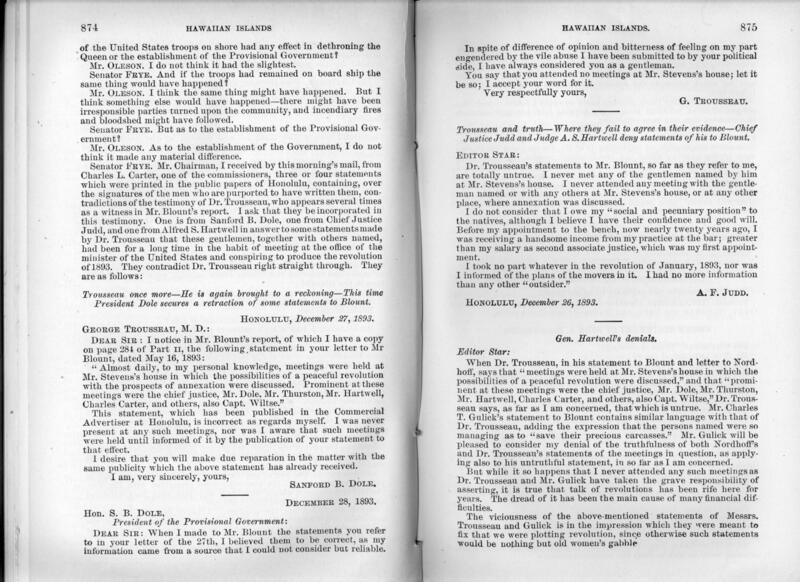 When Dr. Trousseau, in his statement to Blount and letter to Nordhoff, says that "meetings were held at Mr. Stevens's house in which the possibilities of a peaceful revolution were discussed," and that "prominent at these meetings were the chief justice, Mr. Dole, Mr. Thurston, Mr. Hartwell, Charles Carter, and others, also Capt. Wiltse," Dr. Trousseau says, as far as I am concerned, that which is untrue. Mr. Charles T. Gulick's statement to Blount contains similar language with that of Dr. Trousseau, adding the expression that the persons named were so managing as to "save their precious carcasses." Mr. Gulick will be pleased to consider my denial of the truthfulness of both Nordhoff's and Dr. Trousseau's statements of the meetings in question, as applying also to his untruthful statement, in so far as I am concerned. But while it so happens that I never attended any such meetings as Dr. Trousseau and Mr. Gulick have taken the grave responsibility of asserting, it is true that talk of revolutions has been rife here for years. The dread of it has been the main cause of many financial difficulties. This page was last modified on 11 December 2005, at 08:23.